TORONTO, ON (May 19, 2009) – The number of Canadians developing food allergies continues to grow everyday and for many, it is getting harder and harder to find something to eat. 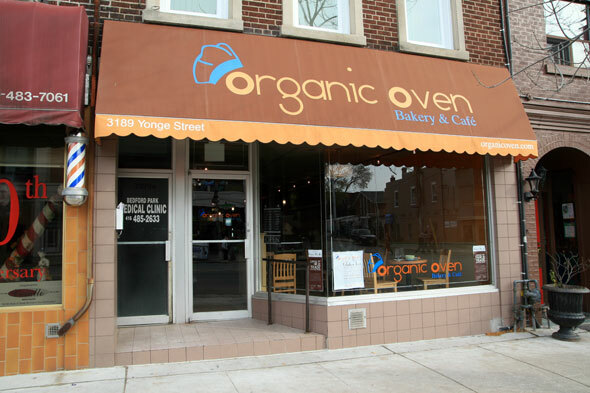 Seven years after opening its doors in a modest 500-square-foot industrial space in Brampton, Organic Oven is proud to announce that it has opened a totally gluten-free specialty bakery on Yonge St., just north of Lawrence Ave., in uptown Toronto. In addition to being totally gluten-free, Organic Oven Bakery & Café also caters to other dietary needs such as vegan, dairy-free, eggless, diabetic-friendly, low-glycemic and/or flourless diets. The café also serves certified organic and certified fair-trade specialty coffee and beverages, and uses biodegradable packaging. ABOUT GLUTEN – Current statistics estimate that at least one out of every 133 Canadians has celiac disease and experts argue that many more have sensitivities to wheat and gluten. Many of them have also developed sensitivities to other ingredients such as milk, sugar and eggs. According to the Canadian Celiac Association, gluten is the protein found in wheat, rye, barley and related grains. It helps bread and other baked goods bind and prevents crumbling. Because of this feature, it is widely used in the production of many processed and packaged foods. May is Canadian Celiac Awareness Month. HISTORY – Organic Oven first opened its doors in 2002. Its products are available at most major health stores in the Greater Toronto Area including Whole Foods Market, the Big Carrot and Noah’s Natural Foods. Local eateries such as Magic Oven and the restaurants of many five-star hotels also serve Organic Oven’s breads and desserts. Organic Oven and founder Peachy Yutangco has been featured in the Toronto Startwice. Read the most recent article, written by Emily Saso, by clicking here or by viewing the attachment. To find out more, please visit Organic Oven online at http://OrganicOven.com.